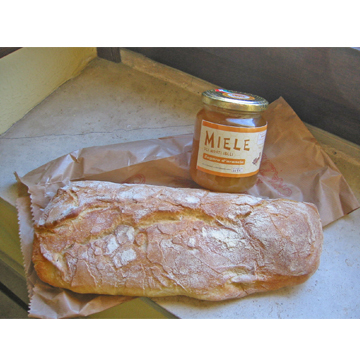 The negozio alimentare or ‘shop of food’ closest to our apartment is the source of ciabatta. Ciabatta is a broad, flat, crusty loaf of bread. It is also the Italian word for slipper – perhaps Gepetto used his carpentry skills and two loaves of stale ciabatta to make slippers for Pinocchio. Fresh from the market, sliced horizontally, topped with cheese, slices of tomato and a few drops of oil, it is the perfect foundation for a mid-day sandwich. When I want garlic bread, I slice it, smear it with a mixture of olive oil, minced fresh garlic, dried oregano and ground black pepper and toast it in the oven. I make “toasterless” toast by sautéing it in butter until golden. Ciabatta more than three days old was too hard to eat until it had been softened. I cut it in quarter-inch chunks, added it to a green salad, poured salad dressing onto it, waited five minutes and then enjoyed it. On Monday, Italian French toast was the recipe of last resort to use the stale end of the loaf. Charles cut the ciabatta into four one-inch thick slices and put them into a single layer in a shallow baking pan. I mixed together one egg and two thirds of a cup of milk, poured it over the bread and refrigerated it for three hours while we were at the market choosing food for dinner. When we got back to our apartment, I sauteed the now very soft bread in butter over medium heat until it was golden on both sides. I put the finished pieces into the toaster oven to stay warm while I sauteed one sliced banana in a bit more butter, and made a small fruit salad with the remaining pear, a few strawberries, a teaspoon of orange blossom honey and a squeeze of lemon juice. This meal was sunny enough to counter the gray sky and chilly wind blowing in from the sea. Our son Matthew arrived Monday evening for a three-week visit and I made dinner to welcome him. Because we had started the Italian French toast before going out, we were late getting to the market and there was less fish than usual. Angelo Cappucio, my favorite fish vendor, waved to me and showed me his last piece of salmon. Timing and friendship are everything at the market. I bought a bunch of carrots with feathery greens, four tender-skinned new potatoes and a kilo of the fava beans that marked the arrival of spring in the market. Fava beans are in the same category of food as artichokes, corn on the cob, lobsters and crabs – when you have finished eating any of these things, the pile of debris that remains is larger than the initial serving, apparently disproving the law of Conservation of Mass. In any case, after more than an hour of shelling, blanching and husking a kilo, a bit more than two pounds, of fava beans I had 147 grams, about five ounces, of edible beans and a large bag full of inedible pods and husks. We expected Matthew on the eight o’clock bus, so I put three thinly sliced new potatoes into a shallow baking pan, drizzling on two tablespoons of olive oil, dusted the top with dried oregano and black pepper. I put them into the toaster oven. The temperature dial on the toaster oven is in centigrade so I turned the dial to point to ‘seven o’clock’ and hoped for the best. I simmered two thinly sliced carrots with a pinch of salt in a quarter of a cup of water. When the carrots were tender and the water nearly evaporated, I added the blanched, shelled fava beans and a teaspoon of butter to the pan and turned off the heat. I heated a tablespoon of olive oil in a skillet, dusted both sides of the salmon with freshly ground pepper and put it into the pan when the oil was shimmering. I cooked it over medium high heat for six minutes on each side until it had browned but the center was slightly undercooked and still pink so it wouldn’t be dry. I peeled off the skin and seasoned the steak with a generous squeeze of fresh lemon juice to finish it. The potatoes were tender with crisp edges, the orange and green of the carrots and fava beans said, “Welcome Spring!” and the salmon was scrumptious. Made with ten ingredients – potatoes, fava beans, carrots, salmon, olive oil, lemon juice, butter, oregano, salt, and pepper – dinner was simply delicious. Would it be possible to have an index of some sort to your wonderful recipes? For instance, if I wanted to look for something you’ve done with figs…or any number of your other clever creations. As wonderful as it is to read your writings, I don’t always have the time when I am searching. You can use the search box on the blog to find recipes.